Welcome to the hop! Today we are celebrating the Technique Junkie Newsletter's Annual CD sale - all ANNUAL CDs are just $10.00 plus postage! This is a huge savings, and is a great way to catch up with techniques from previous issues. Each of the CDs has between 70 and 100 tutorials on them, in step-by-step, pictorial format. Information about each CD, with a list of what is on each and a link to order, is HERE: http://www.techniquejunkies.com/cd-sale-612.html. If you arrived from Jackie's Blog, you have reached the final stop. If this is your first stop, I suggest you start at the Design Team Blog so you can see all of the artwork. Each of the designers in the hop are celebrating by showing you a few projects from one of the nine Annual CDs. As the final stop on the hop, I am featuring CD9. I made three cards from tutorials on the CD, two from the June 2011 issue and one from CD 9's bonus techniques. Each CD has 10 bonus techniques on them that are only found on the CD. The top card shows the Copic Airbrush Embossing technique. These stamps from Mark's Finest Papers were practically MADE for this technique! 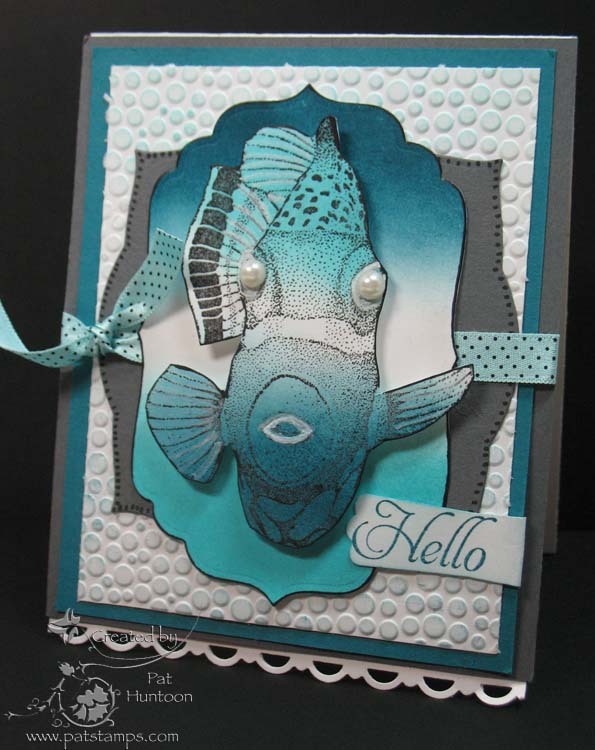 The fishy card in the middle shows the Color Sandwich Technique. I changed it up just a little by switching the fish around so that the colors pop more. I couldn't resist the pearls on the eyes, either! 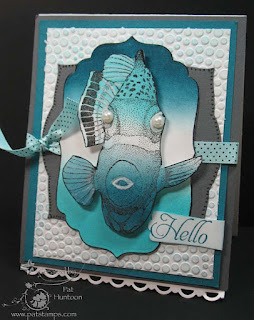 The stamps on the fish card are from I Brake for Stamps. Finally, the last card features the Negative Strips Technique, one of CD9's bonus tutorials. 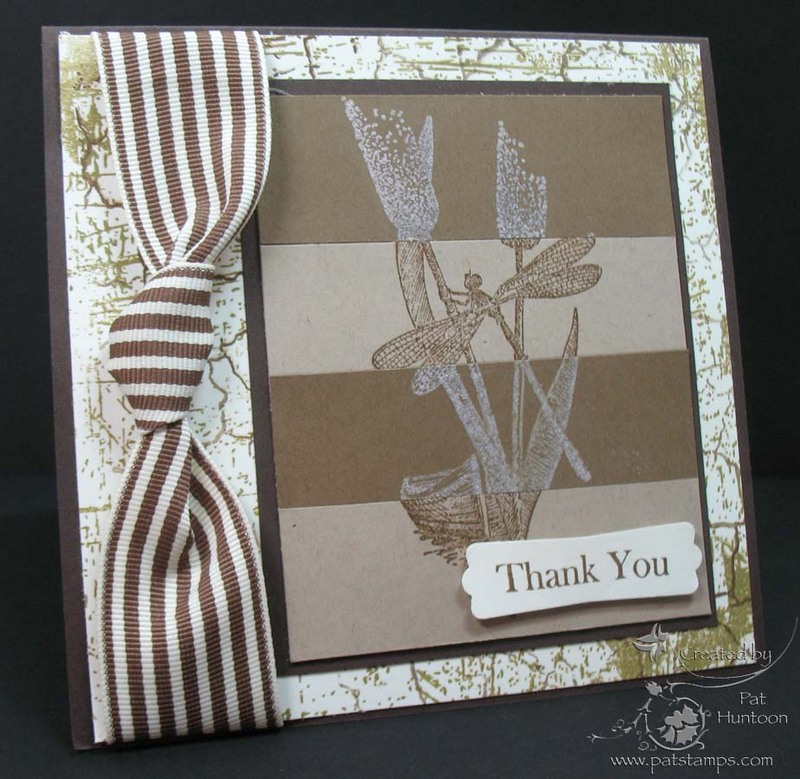 The Impression Obsession stamps used for this card -- both the front image and the two background stamps, were perfect for this technique. I hope you have enjoyed this hop! I encourage you to consider the CDs, too, if you don't already have them.They are a great bargain for the price! Beeswax Beehive from the new issue! When I first saw this tutorial -- one of the 15 new tutorials from the just-mailed June 2012 issue of the Technique Junkie Newsletter -- I was skeptical. Then I started playing -- and I am in love! If you already subscribe, you will notice on the Subscriber-Only Artwork pages that I was prolific in creating Beeswax Beehive Artwork. I could have created more, too, but I ran out of time. This is one that I will definitely do again. The June issue of the Technique Junkie Newsletter was mailed today, and the issue is online right now for you to look at: http://www.patstamps.com/SOP_home.html. There are so many fun new techniques try, you won't know where to start! 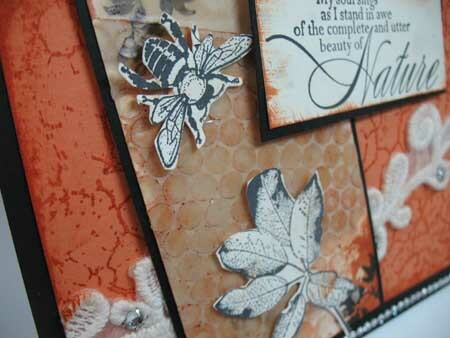 Back to the card and technique -- I have had beeswax in my stash since June 2004 when I published the Textured Beeswax Tutorial (Now I am inspired to do that technique again . I know I can do it better, too, with 8 more years of stamping under my experience belt!). It felt good to drag out my melting pan and the beeswax. I haven't touched the melting pan in a while, either, and using it gave me an idea that I filmed for a later issue. In any case, the stamps used here are from I Brake for Stamps. IB4S offers 10% off your order with the code TJ10, too! Stay tuned -- tomorrow we have a Blog Hop celebrating the Annual CD Sale! Hope you enjoy this new issue. I think this is the last in the series (for now) from the Sweet 'n Sassy Tasty Treat Set. 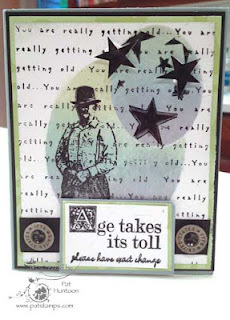 Today's card uses the Stacked Nesties Technique from the October 2011 issue of the Technique Junkie Newsletter. This is one of my favorite techniques, because it is easy and always has a great impact! If you click to open the image, you will notice that I used Flower soft on the popcorn to give it more dimension. The images were colored using the Pastel Chalk Pencil Blending Technique from the June 2011 issue of the newsletter. 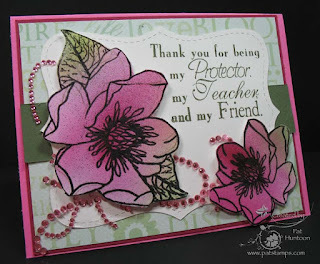 Don't forget that Sweet 'n Sassy Stamps offers 10% off orders with the code tjn2012 ! 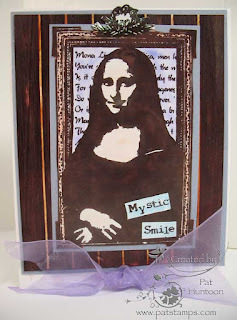 This week's Try that Technique is Layered Masking from the February 2012 issue of the Technique Junkie Newsletter. For my card, I wanted to use stamps that haven't seen ink in a while. All of the stamps here are from River City Rubber Works. You should play along, too! Upload your creations to the TJ art groups -- we would love to see your work. Have a great weekend! 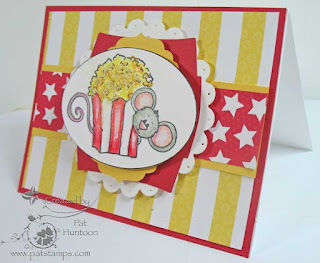 I haven't played in Blogger's Challenge in an eternity -- today is the day! 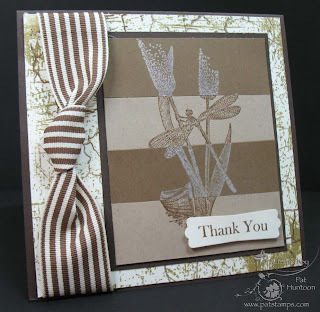 The challenge this week was to use Green, Brown and Neutrals. 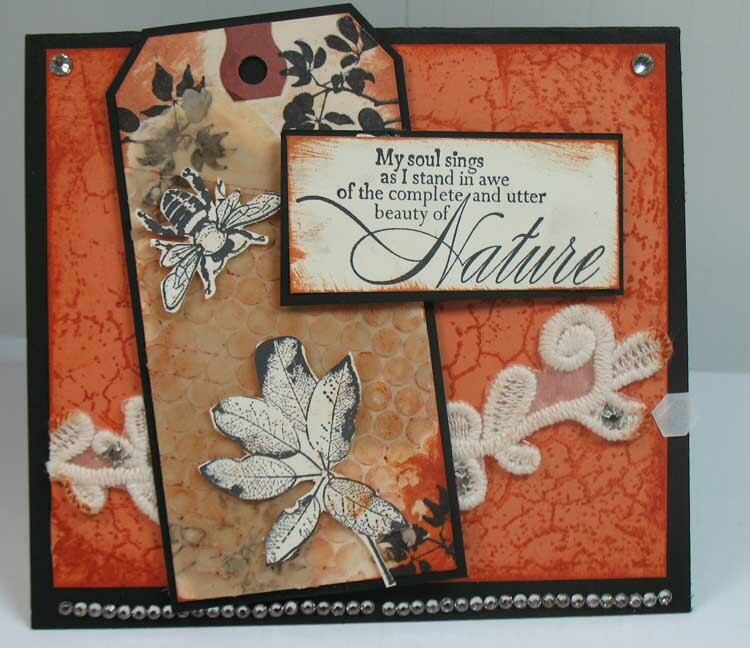 My card uses shades of brown and greens, but I did cheat (just a little) by adding a splash of red to my card. The background on this card uses the Faux Fresco Technique from the Emboss or Die CD. (The CD is still available -- 79 tutorials in pictorial, step-by-step format for $17.95). 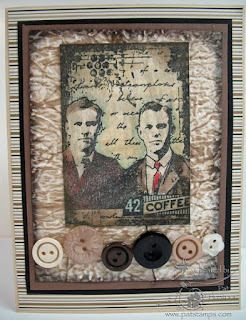 I love how textural it is -- it feels wonderful! 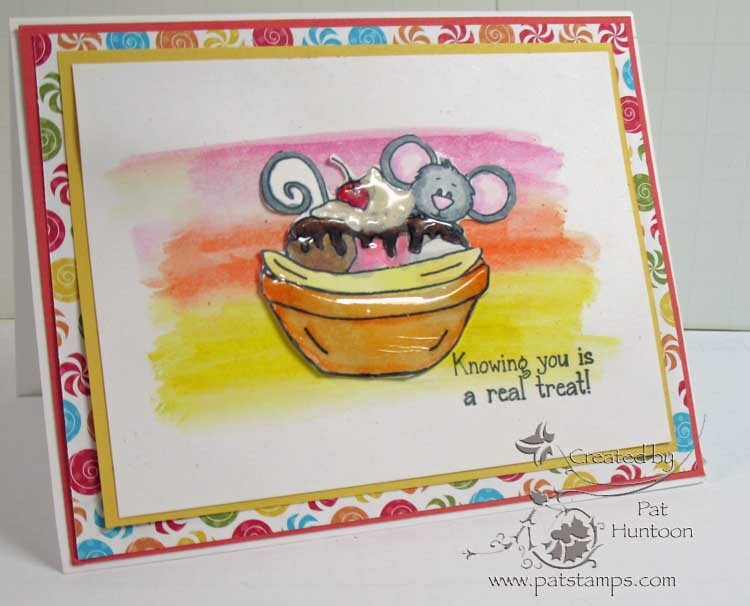 The main image uses the Distress Ink Watercoloring Technique from the December 2011 issue of the Technique Junkie Newsletter. The stamp is from Artistic Outpost. Hope you have fun looking at other Blogger's Challenge Creations today -- play along if you can! This stamp from I Brake for Stamps seems like it needs to be hanging in a gallery. That is why I thought the Varnished Mahogany technique from the February 2012 issue of the Technique Junkie Newsletter would be absolutely perfect for it! My only regret is that you can't see the subtle sheen of the wood in the background from my photo. It is ther, though -- and looks pretty darn much like she is hanging on the wall. You can get 10% off off I Brake for Stamps orders by using the code TJ10. I just placed an order for some of the little flowers and I can't wait to get my hands on them! 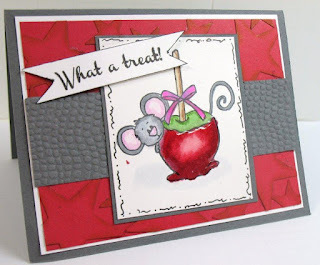 Continuing my on-going addiction to these delicious stamps from Sweet 'n Sassy Stamps, I chose to change-up the Simple Swipes Technique from the February 2012 issue of the TJ Newsletter. Instead of stamping on the stripes directly, I created, then cut out, this cute image, applying it directly over the swiped background. I couldn't help adding Crystal Effects/Glossy Accents/Diamond Glaze over parts of it, with a little Liquid Applique for the ice cream. I thought it made it look, well...yummy. Have a sweet day. Another cute one by me - imagine that! When I filmed this tutorial, I was concerned that the background it creates would be simply too crazy to be used effectively. What I found is that keeping the top image simple was the best way to use the Colorful Stripes Technique (April 2012 issue of the Technique Junkie Newsletter). 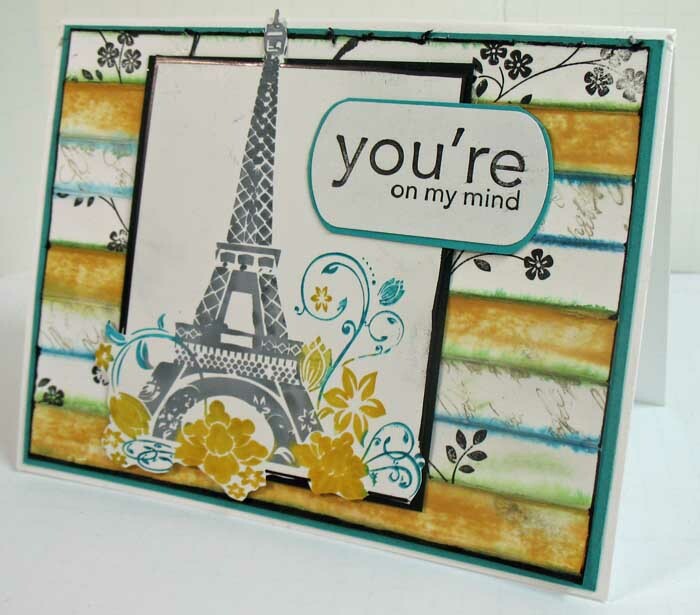 I chose this pretty Parisian image from Prickley Pear, using water based markers to color the image in selected areas. The I used the Out-of the-Box technique from October 2004 to showcase the image, and to allow the bottom flowers to melt into the bottom of the stripes. 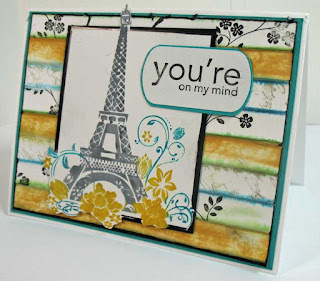 The sentiment and some of the background images are from Stampin' Up! 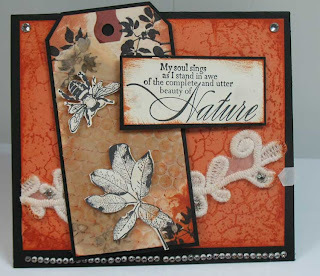 ; other of the background images are from Sweet 'n Sassy Stamps. You should try this one -- it is easier than it looks and the results can be really pretty! I was discussing this card with one of my dear friends, and she reminded me that "I don't do cute." Guess what? YES I DO! I love to color, and if the images are fun and inspire me, then all the better. 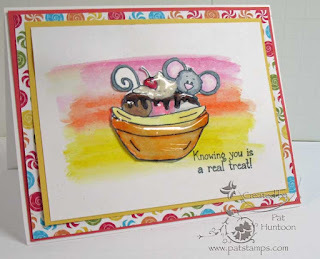 These images from Sweet 'n Sassy Stamps certainly inspire me. When I first picked up the stamp set, I was immediate moved by their possibilities. In fact, when I was playing over the weekend, I think I used every stamp in the set! I will spread them out over the next week or so with other things mixed in-between. My Candy Apple Mouse uses a Mono Dies Background (Emboss or Die CD). I used Copics for coloring, and added a glaze over the candy apple with Crystal Effects. Really, it is a simple card, but yes....CUTE. Don't forget that Sweet 'n Sassy offers a 10% discount using the code TJN2012. Have you seen the new stamps just released? I am in trouble! Cascading Images -- Try that Technique! Today I am sharing one of the, um, fruits of my labor. The Try that Technique theme this week is Cascading Images from the April 2012 (current) issue of the Technique Junkie Newsletter. 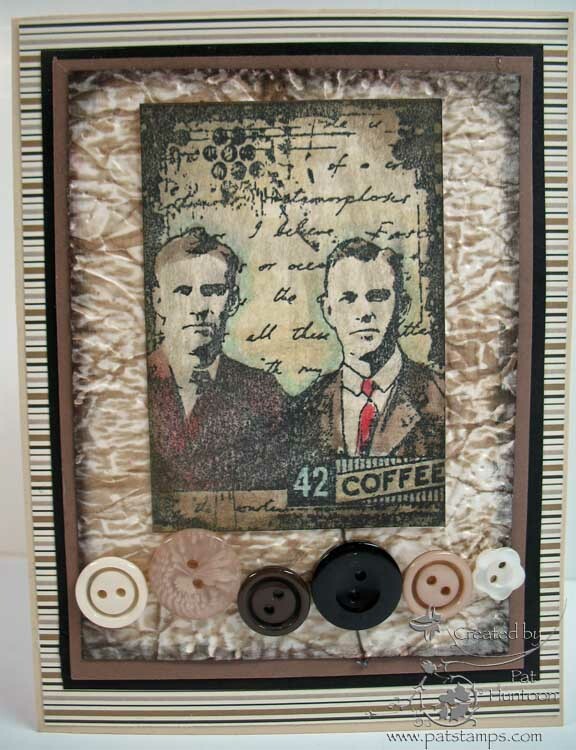 These fun stamps are from Mark's Finest Papers & Stamps, a Heinrich Co. -- I just love them! 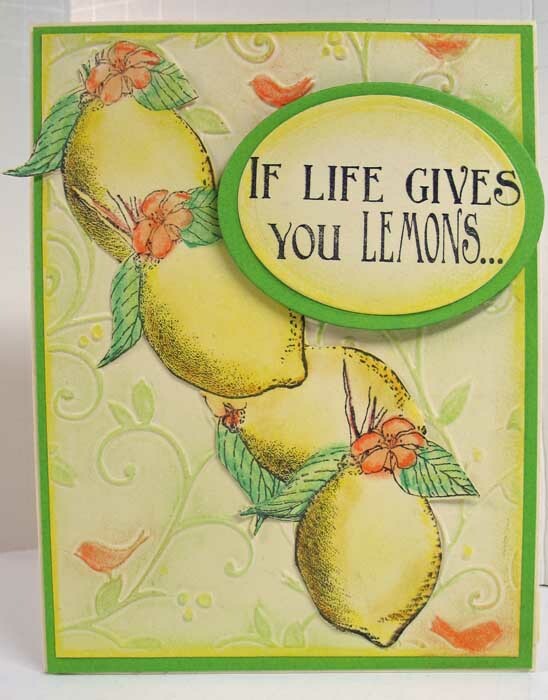 They come with several saying, but my favorite is the combination I used on this card: When Life gives you Lemons... (on the front) and inside:"Throw them back and demand chocolate!" I, for one, can relate to that. Remember that MFP offers a 15% discount to Technique Junkies using the code WEEKENDER2. 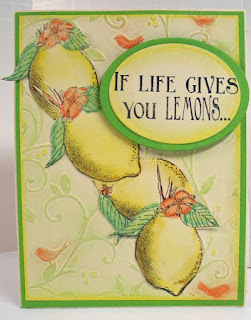 I colored the lemons and edges with Pastel Pencils using the Pastel Chalk Pencil Blending Technique from the June 2011 issue of the Newsletter. The background embossing was colored using the Pastel Embossing Technique from the Emboss or Die CD. In any case, I hope you have a chance to try our featured technique this week. I would love to see what you do! And I hope you don't get sick of my postings...I have ALOT to share!